The Graz-born conductor and composer, Siegmund von Hausegger was unfortunate in securing long-lasting fame in neither capacity. His high noon came too early for the record industry to carry his name into the twentieth century although he lived until nearly half way through its span. He recorded Bruckner's Ninth Symphony in 1938 but as far as I can see there was nothing else. His footnote status as a Wagner admirer and Bruckner conductor have ensured that he has not disappeared utterly. He left behind two operas (Helfrid (1893), Zinnober (1898)), a Mass (1899) and a Requiem. Somewhere out there the diligent researcher might find a three-movement Frühlingssymphonie as well. CPO have made a project out of recording his orchestral music. There are to be three discs of which this is the second. The first revealed to the world his hour-long 'stunningly magnificent' Natursymphonie for large orchestra (1911). CPO have already recorded the music for the final disc which will set out his 47-minute tone poem Barbarossa (1900) and Three Hymns to the Night. These will be on 777 730-2 (not yet issued). My fears that Aufklänge - a set of variations for orchestra on the lullaby Schlaf kindchen schlaf - might be stodgy were misplaced. I wondered if they would be academic, involuted and afflicted with the jerky stop-start tendencies of some other variations. While I like Franz Schmidt's Hussar Song Variations they do tend to jump about, halt and lurch. Aufklänge comprises a theme and eight variations. The work proceeds in a seamless narrative flux and is presented by CPO in a single track. It has its climactic moments but a gentle muse predominates with much writing at piano or pianissimo. This aspect sounds like a sort of mediation between Grieg, Richard Strauss, early Delius and Röntgen. The pages where exuberance breaks free often recall Mahler; try the whooping horns at 22:23. The orchestration is that of a fine craftsman and there is a confident maturity about this very fine score that testifies to the fact that he can use a large orchestra with scalpel precision. The Dionysische Phantasie from the turn of the old century is a different beast. Here von Hausegger lets loose a gargantuan Straussian swagger, voluptuous swoon and a blitz of late-romantic excess that at times tips over into bombast. Eckhardt van der Hoogen's long liner-note tell us that this work was, during its early years, meant to be listened to with a 36-stanza poem providing the scaffolding for the music's pilgrimage from joyful play via desolation to the awakening of artistic energies. This composer did not go as far as Joseph Holbrooke in his symphony Apollo and the Seaman which during its few performances had Lord Howard de Walden's poem of the same name projected via magic lantern. The Dionysische Phantasie is all over in about 20 minutes while the Holbrooke runs to close to an hour. The Phantasie has its good moments - some lovely ideas towards the end - but it's rather over-cooked. None of the weaknesses are down to Antony Hermus and the Bamberger Symphoniker whose excellent work is well advocated by the audio-technical team. This carries over into the other tone poem: Wieland der Schmied (Wieland the Smith). This takes as its subject one that had drawn a libretto from Wagner but not an opera. Wieland is an obstreperous cauldron of a piece related in this way to the earlier Dionysische Phantasie. It offsets this with gentle Straussian pages and episodes for solo violin. It also boasts a most successful line in nobility in the last five minutes. 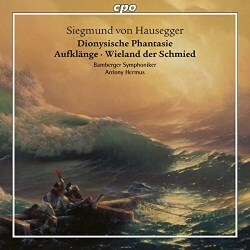 I am far from convinced by the Phantasie but the other two works - especially Aufklänge - speak strongly for a future for von Hausegger's music.